Originally this was supposed to be a breakfast side dish I'd picked to make for myself and a guest one morning a few weeks ago: Southwest Potatoes. That never happened. But as this morning quickly turned into afternoon, I decided to pull the recipe out again and try a different approach. Because what doesn't taste good thrown into a roll and called a sandwich? 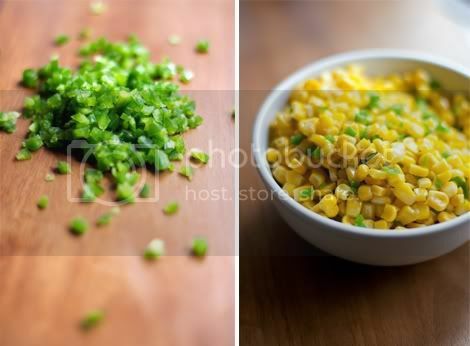 The dish comes together quickly and easily, with the jalapeño and sweet corn mixture making a pretty fabulous side dish in it's own right. I used Daiya vegan cheese to top off my potatoes, but if you're a lacto-ovo vegetarian, white cheddar would be an excellent alternate choice! To start: Preheat your oven to 450°F. 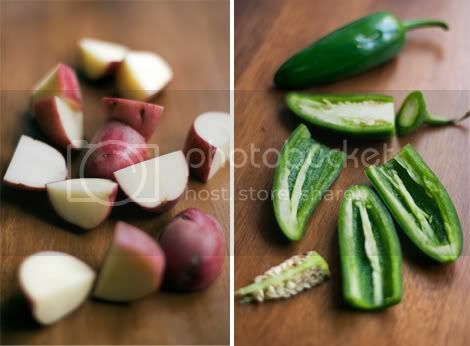 Cut potatoes and jalapeños and set aside in separate bowls. Heat a large skillet over medium heat. Add 1 tablespoon of oil to the skillet. 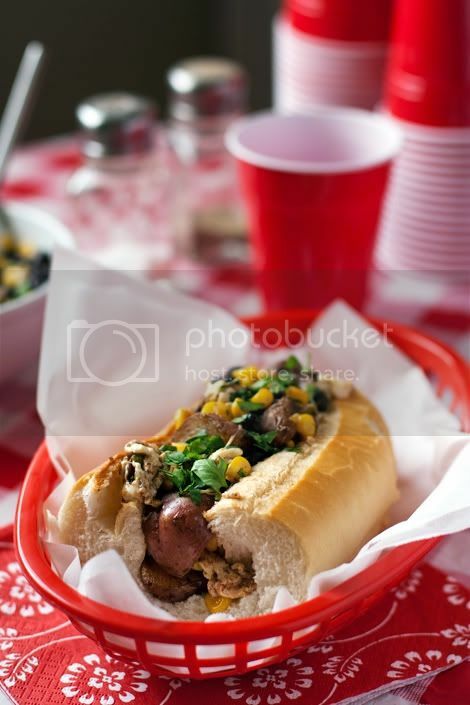 When the oil is hot, add jalapeños and corn, and sprinkle with salt and pepper; let sit for a moment. When corn begins to brown, stir to distribute for even browning. Remove corn and jalapeño mixture to a small bowl and set aside. Prepare the potatoes: Add remaining oil to pan. When hot, add potatoes and spread out evenly over pan. Cook, undisturbed, until they begin to brown around edges and release from pan, about 10 minutes. Continue, 15-20 more minutes, turning potatoes occasionally with a wooden spoon to brown all sides. Add oil if needed to prevent sticking, and lower heat if needed to prevent scorching. When potatoes are tender and golden, add chili powder, corn and beans. 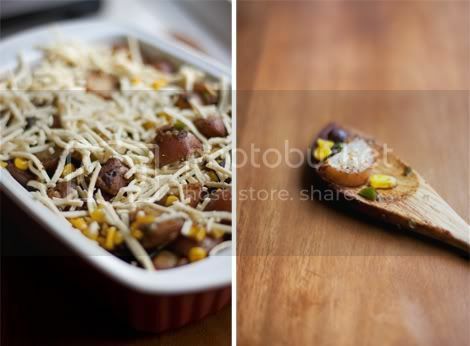 Transfer potatoes mixture to a baking dish, sprinkle with Daiya and bake in the preheated oven for 5-10 minutes until Daiya is melted and beginning to brown. 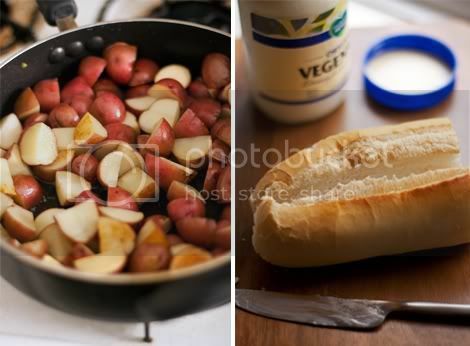 In the meantime: Spread Vegenaise or mayo inside sliced rolls (you may also want to remove a bit of the interior bread from each sliced roll to allow more room for the potatoes) and plate them. When the potatoes have finished baking, remove them from the oven and allow to cool for a few minutes. 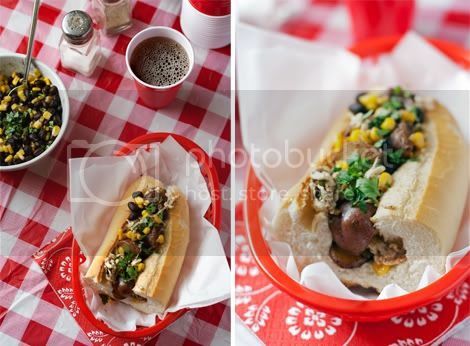 Spoon potatoes into each roll, filling to the top and making sure to get a fair amount of corn, beans and Daiya on top of each sandwich. Garnish with cilantro and serve.